It’s hard to keep up the exercise regime when the evenings draw in. Walking in the dark is hard enough and when you’re running at pace, the last thing you want to do is trip over a stray tree root. To avoid this, you could give up the running and go the gym instead. But let’s face it, the gym gets expensive and you may actually enjoy getting a bit of fresh air after a day in the office. The solution here is a head torch – stick it on your head, or even over your hat, and let it guide you through the dark. So what should you be looking out for when purchasing a running head torch? First, the brightness. 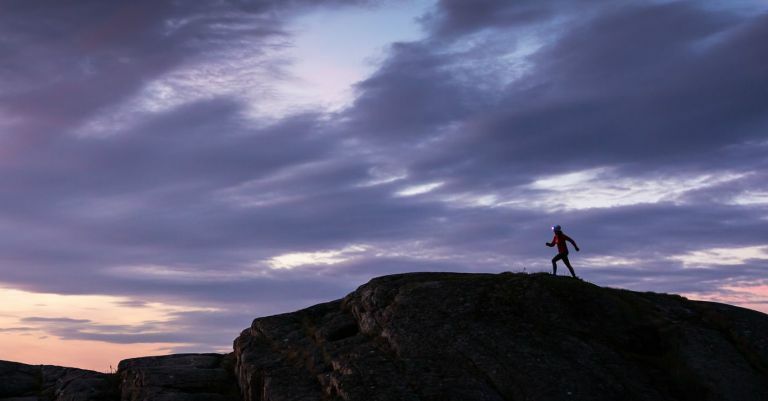 Think about where you go out for a run – do you run through suburban areas where street lights do much of the guiding, or do you run cross-country, where wild woodlands and wide open fields present themselves as large vacuums of darkness? Some head lamps offer up more light than others, so make sure to check out the lumens – the higher the brighter. Anything over 500 lumens is a pretty powerful head light, making it ideal for cross country running and large expanses of dark landscape or woodland. This intense level of light is also great for tow path runners, ensuring you can be clearly seen. Lumen levels of 100 are perfectly sufficient for pavement pounding in built-up areas where you frequently get a helping hand from street lights. Second, think about the battery life. Are you a frequent runner who goes out for an hour at a time, or do you go out for half an hour a couple of times a week? Frequent runners may want to think about a rechargeable lithium battery, while those who head out every couple of days could think about an alkaline battery. Last, the weight. No one wants their head torch to be a pain in the neck. The more lumens, the bigger the bulb and battery power; so naturally, the higher the power, the heavier it is. So armed with everything you need to think about, discover the best running head torches right here in our list. This durable and lightweight running head torch is suitable for both suburban and cross-country running due to its three level power metre and multi-programmable beam pattern. On full beam, with a single battery, this running torch will last an hour- more than enough time to power through some miles- but attach its support cell and you can get up to three hours with it. The only issue with adding the support cell is the weight increases to 121g – still light by head torch standard, but enough for you to feel the difference. The dimmer the brightness, the longer the battery power, so suburban runners will benefit from longer time periods without charging. This head light packs in four different light modes enabling you to tailor the light to your running requirements and you can opt for one of two brightness modes dependent on your surroundings. For the price, this torch certainly packs in a lot of technical features – hence the number one spot as the best running head torch. Serving up some serious power (760 lumens) and performance in the toughest of conditions, this Petzl running torch means business. It offers up four brightness modes, so you can choose whether you’re going for the maximum beam for two hours, the dimmest beam for 38 hours or somewhere in between. The brightness is designed to be easy to change on the run – all you need to do is twist the nozzle on the side. It’s bulkier than the first torch on our list, and a lot heavier (370g), which is what you’re going to get when the head lamp delivers floodlight power. If you’re looking for a head torch that’s designed for running and extreme sports in general, you’ve found it here. Just be prepared for the weight. When you’re battling your way through the woods, investing in a torch that offers up a floodlight so you can see all around you and a spotlight so you can see way ahead in the distance is certainly a good idea. If you like the brightness of the previous pick in our list but don’t like the idea of the weight, you’ll have to compromise on battery life. Offering up 500 lumens on max power, this torch is not short on brightness, but will only last for an hour and half on full beam. Having said that, the battery is rechargeable; so as long as you’re not going on marathon missions, you’ll be fine. The torch itself is fairly compact and with four power modes, you can optimise the beam to your surroundings. If you can’t help being drawn to intelligent devices, this one won’t fail you. It’s star component is its reactive lighting, which senses the amount of light wherever you are and adjusts the beam accordingly. This works in its favour, as in maximum brightness mode it offers up three hours 30 minutes of battery time and in the weakest brightness mode, 12 hours. The manufacturer says the red lighting mode will preserve your night vision, while the weather resistant casing makes it suitable for running in all weather types. The only downside of this head lamp is the lumens, which is the lowest of all our rechargeable head torches. In terms of how AA battery powered head torches go, this is one is pretty good - it has been given the Duke of Edinburgh approval after all. Offering up 220 lumens of power and a max battery output of 180 hours (on the dimmest setting), suddenly the thought of non-rechargeable batteries doesn’t seem so bad. With six lighting modes and an adjustable beam angle, you’re completely in control of the torch, while the red LED on the rear will keep you visible from a distance if you’re running along roadsides. With a water resistant body, it’ll see you through all types of weather as you power through the winter runs. If you run in suburban areas, it’s more of a case of helping you to be seen and providing light in areas where street lighting is low, which is why this head torch is perfect. It may be cheap and cheerful, but the battery life lasts 40 hours in the weakest beam and the lumens, while the lowest on our list, is well suited for purpose. An upside to the low lumens is the weight of the product, which is the also the lowest on our list – great if you’re looking to forget that you have a headlight on your head. If you’re looking for head torch that will leave you with plenty of spare change, this one could seal the deal. There’s 220 lumens of brightness coming from the LED torch, which reviewers say is durable and well-made. There’s also up to 30 hours of battery life when used on the dimmest setting and around three hours on the brightest. The only downside seems to be the lack of padding behind the torch, which could make it a little uncomfortable when jogging along. However, if you’re into a bit of DIY, it wouldn’t be too hard to stick some padding on yourself. If it saves you money, why not? Once you've kitted yourself out with the best head lamp for your needs, make sure you layer up; check out the best men's base layers by our colleagues on TheRadar.